Riders will face temporary changes to their route within the Lloyd Street business estate near South Kensington station from this weekend. The Melbourne Metro Tunnel project is developing a worksite above the future tunnel alignment that will restrict access within the estate, and switch roads to one-way traffic at some locations. As a consequence, bikes will be detoured a short distance within the estate to avoid any conflicts with on-coming one-way traffic. 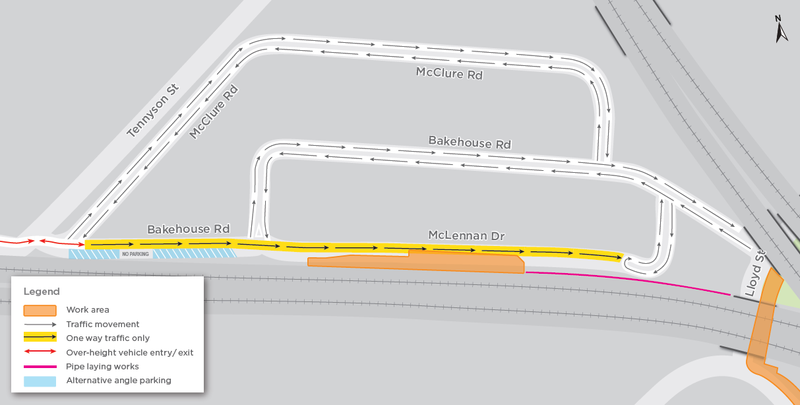 This entails bikes travelling on McClure Road rather than Bakehouse Street or McLennan Drive. Traffic management will be in place to direct riders onto the safer detour for the first few weeks. Riders should be alert and follow any directions from traffic controllers, and observe signage. Signs apply to bikes as well as motor traffic. There may understandably be some confusion over the change initially, so be patient. The changes will be in place for up to six months and bikes will be required to use McClure Road for this period. Although the Lloyd Street estate is a popular, convenient and safe route for bikes, it is all private land and bikes are guests when on the estate. The work being undertaking involves injecting grout into the soil at several points where the two rail tunnels will be located. Soil conditions under the Lloyd Street precinct are poor and need stiffening up to allow cross tunnels to be built. The cross tunnels are small tunnels that link the two main rail tunnels at regular distances. The Lloyd Street South Kensington detour.